2019 Davis Meet Weekend Planning is underway and the date has been set! Saturday, April 27, 2019 - Sunday, April 28, 2019! Saturday will be A-La-Carte Events. Sunday is the 20th Annual Davis Car Show & Swap Meet. Event details are still being coordinated and confirmed. When details are released, announcements will be posted. Looking forward to seeing you all at the 20th Annual Davis Meet Weekend in April! Hope you are well and looking forward to the 20th Annual Davis Meet Weekend on Saturday, April 27, 2019 - Sunday, April 28, 2019! Saturday RSVPs and Sunday Pre-Registration are now open! This folder and these documents can be saved to mobile devices "offline" so event information, maps, etc. can be accessed on the day of the event (even without wifi / data access). Saturday Event RSVPs are now open and close Sunday, April 21, 2019. Sunday is the Davis Car Show & Swap Meet. 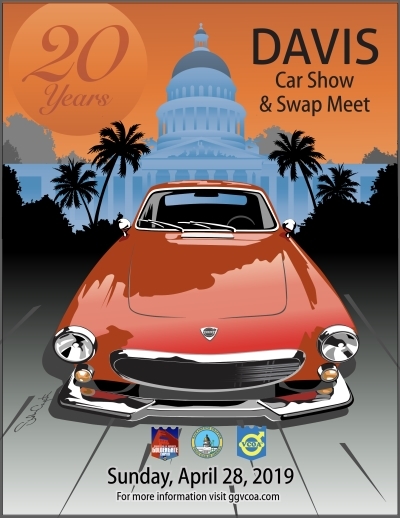 To celebrate the Davis Car Show & Swap Meet's 20th Anniversary, we are lowering the Sunday Show Registration price to $20.00. Sunday Car Show Pre-Registrations are now open and close Sunday, April 21, 2019. Sunday Swap Vendor Pre-Registrations are now open and close Sunday, April 21, 2019 (or until filled). Interested in contributing to the 20th Annual Davis Meet Weekend as a Volunteer? Looking forward to seeing you at the 20th Annual Davis Meet Weekend in April! The 2019 Davis Meet Weekend Event Poster with Premier Sponsors has been added to the Davis Meet Weekend website. Check it out now and look for it in the next issue of Rolling! Thank you to all sponsors for contributing to the Davis Meet Weekend event and helping to make it such a great weekend! Interested in contributing to the show's success? We especially need Day of Event Volunteers to help with the Sunday Davis Car Show operations. Let us know how you can help! We look forward to seeing you at the 20th Annual Davis Meet Weekend in April! There is one week left for Saturday RSVPs and Sunday Pre-Registration! There is no charge for these events, but you must pre-register online at GGVCOA.com by the deadline, April 21th. The show is open to all Volvos and Volvo-powered cars. Admission to the show field for cars is from 8 a.m. until 10:30 a.m. and the registration cost is $20 per car, payable in advance online at GGVCOA.com or $30.00 at the entrance gate (cash only) on the morning of the Show. Thank you to all of our current day of event volunteers! A friendly reminder to please meet at Central Park (at Third and C Streets) on Sunday, April 28th at 7:00 AM. Looking forward to seeing you at the 20th Annual Davis Meet Weekend next weekend!